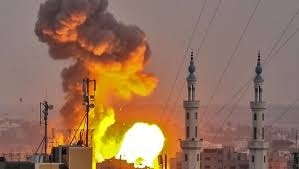 AKIPRESS.COM - Gaza's militant Hamas rulers said Saturday they had accepted a cease-fire ending a massive Israeli onslaught on militant positions after a soldier was shot dead, once again pulling the sides back from the brink of a full-fledged war. Israel and Hamas have fought three such wars over the past decade and Hamas agreed to the second such cease-fire in a week under heavy Egyptian and international pressure, CBSreports. Even after last week's cease-fire ended the fiercest exchange of rocket fire and Israeli airstrikes since the 2014 war, incendiary kites and balloons continued to float from Gaza into Israel setting off damaging fires to farmlands. Israel has stepped up strikes since then to signal its new threshold for engagement after months of largely refraining to act. On Friday, a Palestinian sniper killed an Israeli soldier along the border -- the first casualty it has sustained in four years -- and Israel unleashed an offensive it says destroyed more than 60 Hamas targets, including three battalion headquarters. Four Palestinians were killed, of which three were Hamas militants. "The attack delivered a severe blow to the Hamas's training array, command and control abilities, weaponry, aerial defense and logistic capabilities along with additional military infrastructure," the Israeli military said in a statement, adding that the strikes "will intensify as necessary." Following the clashes, the U.N. Special Coordinator for the Middle East Peace Process called on all sides to "step back from the brink" of war. "I expect all parties, all sides to do their best right now. Not next month, not next week, right now, to prevent this escalation," Nickolay Mladenov said, BBC News reported. He specifically called on Hamas and Islamic Jihad, the two largest militant factions in Gaza, to halt the launch of rockets and prevent Palestinians from trying to breach the border fence. Israel's top leadership convened late into the night Friday at military headquarters to discuss potential actions. "Hamas terrorists opened fire today on Israelis. Those are not 'protesters,'" Foreign Ministry spokesman Emmanuel Nahshon wrote Friday on Twitter. "We will not tolerate attacks endangering Israelis. Under no circumstance." "If Hamas continues to fire rockets then Israel will respond in a much tougher way than they think," Israel's Defense Minister Avigdor Lieberman said in a statement Friday, the BBC reported. The Israeli retaliation Friday to the soldier's killing was fierce, but Hamas' response was far meeker with just a few projectiles launched that were intercepted by Israel.